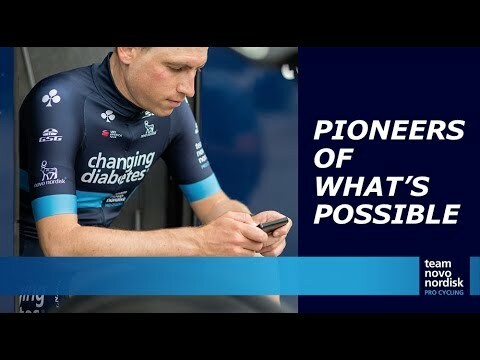 At Team Novo Nordisk, we’ve always embrace technology as means to enable our guys to be to be out there racing with with diabetes. The things that we’re doing now mean the kids in the schoolyard living with diabetes have a hero. It’s not just an individual racing with diabetes, it’s a full team. We cannot fail because of diabetes. The technology exists to facilitate success. Here I am now, I’ve got Freestyle Libre on my left arm, I’ve got a Medtronic 670G on my right arm. I’m testing out every new device and technology that exists to ultimately…if we can make it easier for the athletes to race with diabetes, we can take some of the mental burden off, then they can focus more on racing their bike and being athletes, and being professionals, not just professional athletes with diabetes. Victory for one of our riders is victory for the 1.2 billion affected by diabetes on a daily basis. So we’re going to keep pushing the limits of technology, seeing how we can get the data straight to the SRM power meter that we use. Insulin has been a staple in diabetes since 1922, when it was first injected in patients,1921 when it was invented. Ten years ago, continuous monitoring came into the game, and a lot companies are investing there. Now, the biggest and brightest tech companies are coming into the world of diabetes. Apple, Google, Microsoft, just to name of few. And then there’s all these cool little start-ups like Nutrino, who’s becoming a partner of ours. There’s Dexcom showing in their pipeline that they’ve got an M&M-sized CGM sensor that’s going to be an auto-calibrate. Take a screenshot of your food and then it can give predictive guidance on what your blood glucose can be, how much insulin you need to give, what to expect from outcome standpoint. We’re such a rich dataset. 24 hours, seven days a week, everything that you do has an impact on your blood glucose. All the data we’ve used, it’s just been used to self improve. They next phase is for us is getting research studies done, so that we can educate the health care professionals so they can safely advocate exercise for their patients and give them quantifiable data on the true impact of it. Exercise is the billion dollar drug that never gets prescribed- that makes life good. There’s still a lot of people with diabetes who don’t know about us, and we have to race to the top to make sure the world does.